When it comes to keeping your car cool, nothing helps more than blocking the sun. Sure, parking under a carport or in a garage will help keep your car comfortable. But it’s not always an option. You still need a way to keep that hot Arizona sun out when you’re parked on the street. Both window tinting and windshield sun shades are great options. Here’s how to decide which is the best choice for your vehicle. Windshield sun shades are removable screens that cover the inside of your windshield when the vehicle is parked. They block almost 100 percent of the sun’s light from coming through the largest window in your car. This helps reduce upholstery fade and keeps your dashboard looking like new for longer. If you’re planning on leaving the car parked for several hours at a time, a windshield sun shade will help keep the interior significantly cooler. But they’re limited to use on the windshield only. If you’re looking for a whole-car solution, window tinting is the best choice. 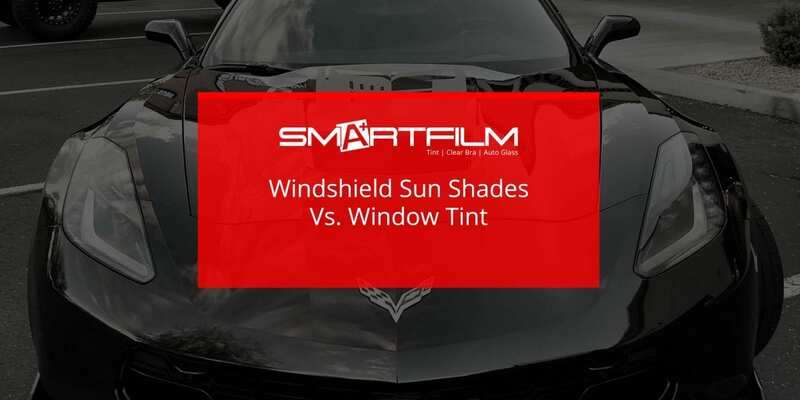 Tinting film is applied to the side windows and rear window of your car and can block up to 77 percent of the light from outside the car, even when you’re driving. This helps keep the seating area more comfortable for passengers no matter what the driving conditions are like. Though the film can’t be used on the windshield, you can still boost its effectiveness by using a windshield sun shade when you’re parked. The more sun you block out, the cooler your car will be. The best way to keep your car cool when it’s in the sun is to combine both window tinting and a windshield sun shade. But you still need to find a reputable tinting company to install the film correctly. Check out our gallery to see examples of our past work or schedule a free installation quote to see the difference that quality tinting can make for your car.